A dog, in a hat, on a bike. Singing. WE had a great day on Sunday, just by going to the park. We saw one of the most surreal things I’ve ever encountered. Yes, we’ve been to Abington Park, in Northampton, hundreds of times. If you get time this holiday, I’d recommend it. And it’s free. We’ve had picnics before, bought an ice-cream from the Park cafe, listened to a brass band play on a sunny Sunday, visited the birds in the aviary, looked around the museum, played football, wandered around the rose garden and fed the ducks. But never, in all my years, have I seen the dog on a trike. The boys were very casual. I asked what they were peering at through the trees. They answered: “A dog on a trike.” Naturally, I thought they were joking. But they explained further. It was a blue dog, actually RIDING the trike, unsupervised. Then I saw it. 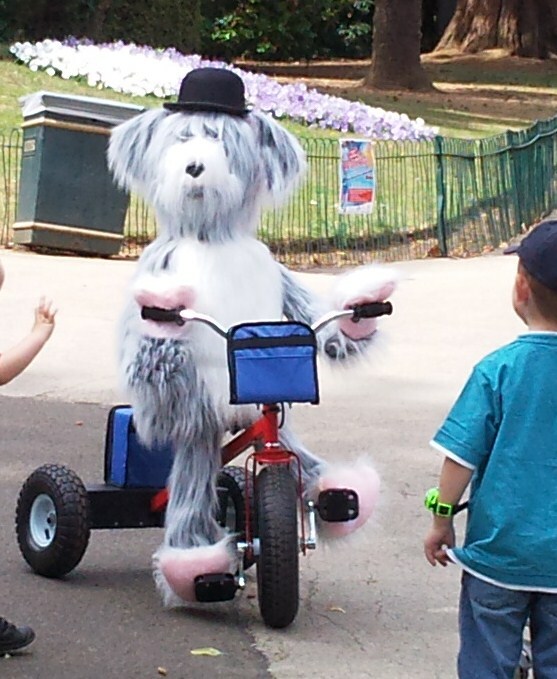 A blue dog, wearing a bowler hat, riding a trike. Singing “Who let the dogs out.” With no sign of anyone controlling it remotely. The Chron actually came up with the answer: He was a remote controlled robot dog owned by a local who hires him out. His roaming was controlled by a headset from a distance. Brilliant!